Set oven to broil. Place marshmallows on a cookie sheet lined with parchment paper. Place cookie sheet on the first rack directly under the broiler. Watch carefully, the marshmallows brown quickly! Remove the marshmallows when golden brown. Immediately push the unwrapped mints into the top of the warm toasted marshmallow. Let the mints melt into the marshmallows. Enjoy the melty, minty marshmallow goodness! 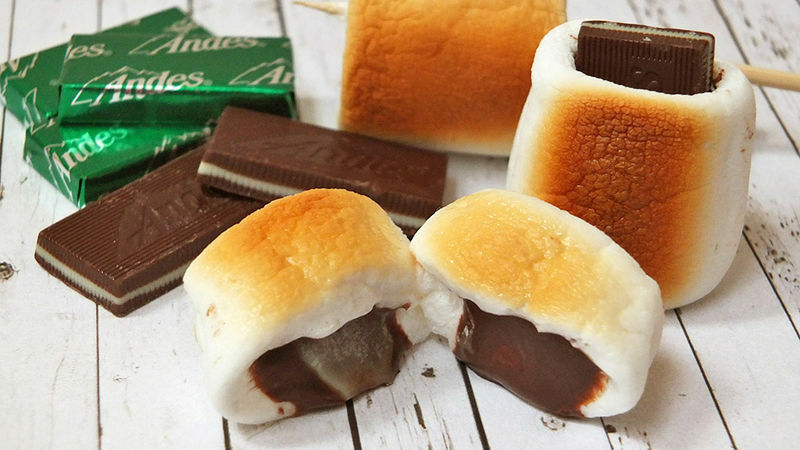 These toasty marshmallows stuffed with Andes mints are a gooey, chocolatey, minty treat. The weather outside is getting colder and that means s’mores. I love s’mores! The toasted marshmallowy goodness along with melted chocolate – well, there’s nothing better. So what to do when you’re craving a s’more, it’s 9pm and you’re already in your pj’s and there isn’t a graham cracker in sight? You could try these Mallow Melts. A toasty ooey-gooey marshmallow hugging a piece of chocolate. I’ve gotcha covered: Minty Mallow Melts. I was never a Girl Scout, but that doesn’t mean I don’t appreciate their contributions to our culture. Let me walk you through this! Imagine a minty piece of chocolate. Now imagine marshmallows. Yeah, yum already, right? Now place those marshmallows on a cookie sheet under the broiler. Remove when golden brown. Hold on, don’t eat them yet, it gets better – I promise. Push the chocolate mint into the center of a warm toasted marshmallow. Graham crackers are now a distant memory. The benefit of toasting the marshmallows under the broiler in your oven versus roasting them over an open fire is that you can make a whole bunch of gooey goodness at once. When you insert the chocolate mints fresh out of the oven, by the time you place the last mint into the last marshmallow, the first one will be ready to eat. That’s right. I ate them right off the cookie sheet. No apologies. This little piece of perfection will make you forget that it’s cold outside and it will just simply make you feel good. And warm. And toasty. Make them when no one is home. Eat them alone. They are messy and you won’t care. Plus, you won’t want to share!